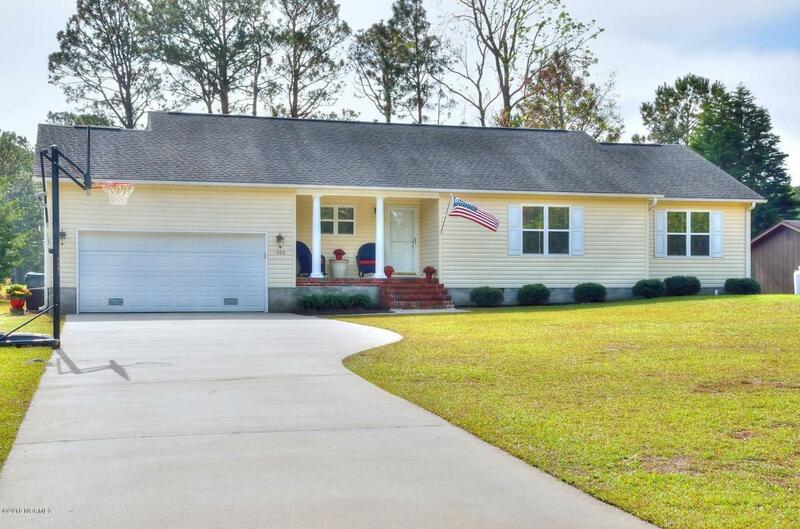 Welcome to this desirable 1 level sprawling ranch home located on the 8th green of The Lakes Country Club golf course in Boiling Spring Lakes. Extremely easy access located off Rt. 87 and absolutely no flooding or storm damage from Florence. The easy living open floor plan offers Bamboo hardwood flooring in the main living areas, fresh paint and stainless-steel appliances in the kitchen. The spacious 15.5 X 11.5 ft. master suit features his and her walk-in closets and the bathroom has new luxury vinyl plank flooring. The 2 additional bedrooms are sizable at 15.5 X 11.5 ft. and 13.5 X 10 ft. with a shared bathroom and its' own linen closet. Enjoy the serene green/fairway views and mild Carolina weather from the screened in porch, private backyard and hand-built walking bridge leading tothe golf course. For storage the home offers a 2-car garage and wonderful outdoor shed for all your lawn equipment. Please make sure to watch our aerial/virtual tour of the home and incredible golf views at your convenience!